PARIS, June 28, 2009 (AFP) -Ahead of the Paris couture shows, top designers have joined a tricky exercise to glam up one of the world's most traditional pieces, the abaya -- the long black overgarment worn by millions of Arab women. 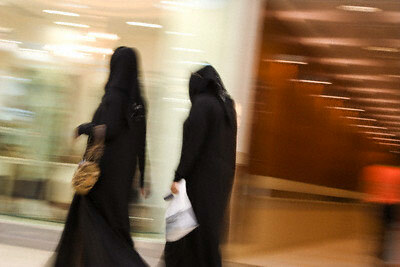 Dubai, UAE, Two Women Dressed in Traditional Abayas and Hijabs, Black Robes and Scarves. "I realised that women in Saudi Arabia wear designer brands but outside have to cover up in a black abaya," said organiser Dania Tarhini, who is Lebanese and the general manager of Saks Fifth Avenue, Saudi Arabia. "I wanted them to be able to wear something with pleasure, not just as an obligation," she told AFP. But Tarhini, who has worked for the company since 2001, said it had been difficult to get Western designers on board. "At first the designers were not that enthusiastic, they didn't really understand, they couldn't imagine how to make a designer abaya," she said. "So I sent them abayas, explained that the concept was to link fashion with culture. "I said that the same women who wear their designer evening gowns will wear their abayas." Upcoming designer from Portugal Felipe Oliveira Baptista, one of the dozen taking part in the Paris couture shows starting early July, said that updating the traditional abaya had been a challenge. "It was interesting to work on a garment that has very specific rules", he said. Abayas traditionally are black, body-covering and floor-length. His was a patchwork of three different black fabrics, cut to lengthen the body. Others came with shimmering Swarosky crystals, gold, velvet or pearl embroidery, and even see-through lace and muslin. "It was not an easy exercise," said French designer Anne-Valerie Hash. "We were all very afraid." The one-off pieces paraded in Paris are to be given as gifts to the royal family and other VIPs, but by September Tarhini plans to have a selection of designer abayas on hand at the boutiques for between 1,500 and 1,800 euros (2,000-2,500 dollars). New collections, to be created twice yearly, will hopefully introduce some colour "navy blue, or dark brown, perhaps," she said. "It is liberating," she said of the bid to update the dress. "It is conservative and daring. "It is fashionable and doesn't go against the culture as long as the women are covered." As to pieces that showed a glimpse of leg, "these are for ladies only evenings", she said.